Perhaps no place on earth captures our imaginations like Africa – the animals inspire a love of nature, the environment, and the world around us. This multi-phase $5 million campaign will improve the visitor experience and provide top-notch animal care. Join us in "Building Our Community Pride." Donate today! Imagine sitting down to lunch in the Zoo’s temperature-controlled Maasai Market Café and watching a Lion stalk across rocky terrain while you enjoy your meal. Glass viewing windows allow you to watch these magnificent animals roll, play, and chase each other only feet away from the renovated café. enhanced seating and views into animal habitats. The complex will offer a natural setting with multiple charismatic Big Cat species. The exhibit will enable visitors to see a pride of up to 10 Lions and cubs. It will also provide a breeding facility for important species that researchers believe could be extinct in the wild in as few as 30 years. 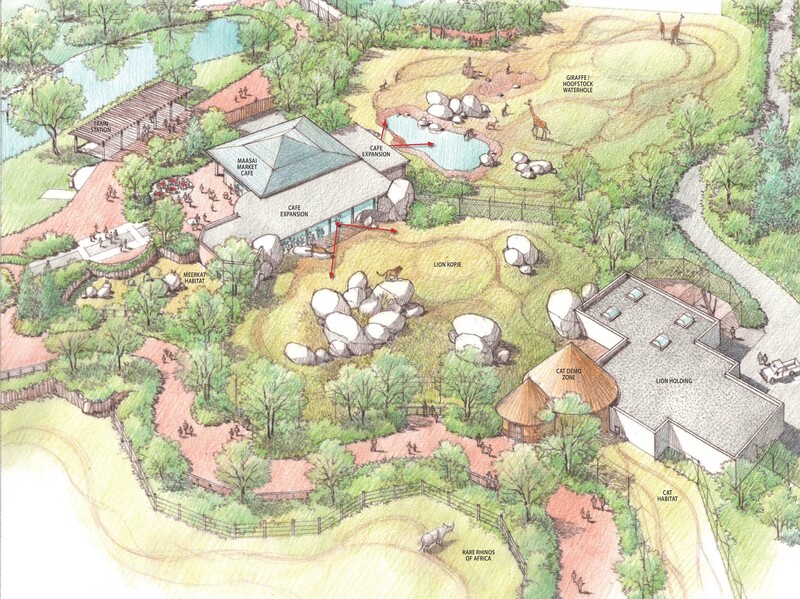 View an aerial rendering of the new Lion habitat. If you or your business is interested in supporting the Lion habitat campaign, please call 605.367.8313, ext. 142, or email our Development Department.